Leah was the older daughter of Laban. 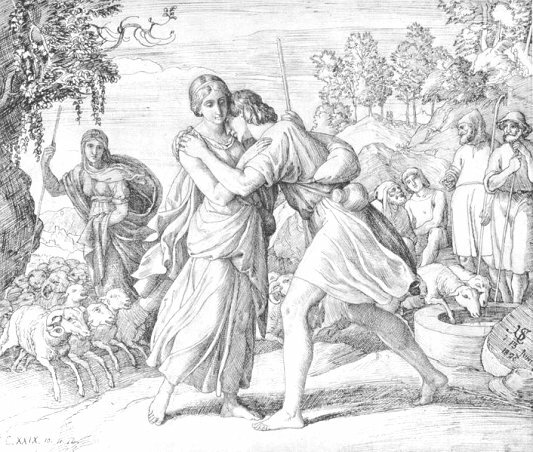 She had a younger sister Rachel who had been promised to Jacob in marriage. It is said of the two girls, "Leah's eyes were delicate, but Rachel was beautiful of form and appearance." When it came time for the wedding, her father Laban substituted brides and Jacob found he was married to Leah instead of Rachel, whom he loved. Their father said his reason for doing it was because in their country it was customary for the older daughter to marry first. Jacob had already worked seven years for Laban in order to marry Rachel, so he agreed to work another seven years, and a week after the first wedding there was a second one in which he received Rachel as his bride. Leah longed for her husband to love her as he loved her sister, but it never happened. She had her first son and named him Reuben which means "behold a son". She was sure her husband would love her when she gave him a son. Her second son she called Simeon, meaning "God hears". Her third son was Levi which means "companion". Surely her husband would be her companion now. The name of the fourth son Judah meant "let Him be praised". Then a fifth son Issachar, and a sixth Zebulun were born. She now had six sons and continued to love her husband, but he did not return her affection. At a later time she would have a baby girl, Dinah, who would be Jacob's only daughter. Rachel meanwhile had not been able to have any children. 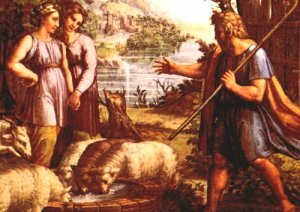 When Jacob left his father-in-law's country he started back to his own country and was met by his brother Esau, whom he had tricked. Esau was coming to meet them with 400 men. Jacob feared for his family. He put the handmaidens in the front of the line, next Leah with her children, and Rachel and Joseph were at the back of the line in the most protected place. Leah again saw where she stood in the family. Jacob would not protect her as well as he would protect Rachel and her child. Fortunately when the brothers met, Esau's anger had cooled in the twenty years since they parted. He meant no harm to Jacob and his family. Jacob's family continued to grow until he had twelve sons and one daughter. Rachel would have a son named Joseph, and later a son called Benjamin by his father. God saw the suffering Leah endured and he blessed her above her more attractive sister. Leah held a special place because of the sons she had. Her son Levi became the father of the priestly tribe of Israel and his descendants include Moses, Aaron, Elizabeth the mother of John the Baptist, Barnabas and Peter. From the descendants of Judah came King David and Jesus, the Son of God. At the end of their lives Leah was the wife who was buried with her husband Jacob in the Cave of Machpelah. Leah was lonely and outcast. She felt she was not special to her husband, but Leah was special to God. God favored her above her more attractive sister and gave her more children. Her sons became important men in the family of Jacob. Sometimes you may feel that you are not special, but you are special to your family and you are very special to God. He will be near to you even if others fail you and cause you unhappiness. English Bible Activities Select story #25 in the list for activities to accompany this Bible story. Spanish Bible Activities Select story #25 in the list for activities to accompany this Bible story. Press "Go" to search for books about Jacob and Leah. I want to take this time to thank you for blessing me and my kids with this wonderful material, on Saturdays I print a class and we sit down and spend time together learning about the word of God. and my kids love it. I don't have to worry about what or how i'm going to teach them about the bible. I just get into your web page and choose. THANK YOU AND GOD BLESS YOU FOR SUCH A WONDERFUL MINISTER . This page displayed 75,508 times.